German industrial production edged down 0.1% in January, marking the second monthly drop in a row. However, none of the sector components have dropped twice in a row and the three-month growth rate for total IP is at a 9.1% annual rate with capital goods at a 23.8% pace leading all sectors higher. Construction output has been more variable, but IP for that industry group is up at a 20.1% pace over 12 months and only somewhat slower over three months. Manufacturing IP shows a drop in December and a nearly identically-sized gain in January. Sequential growth for manufacturing moved up steadily from a 6.5% pace over 12 months to an 8% pace over six months to 15.3 % over three months. EMU members France, Spain and Portugal also have their IP results out on the early side. But there is little here to learn about trend. French IP is sinking sequentially and has three straight months of output declines. Spain shows strong double-digit growth that accelerates over six months and three months. Portugal's growth path is erratic but seems to be improving. Among other European reporters in the table, U.K. output growth seems steady below a 3% pace. Sweden shows IP accelerating well into double digits. Norway logs a string of sequential negative rates of growth and posts a decline in output in January to top it all off. Over the quarter-to-date (QTD), German growth is at the 3% mark, being pulled down by intermediate goods. France and Norway log output declines in the QTD. Spain, Sweden and Portugal log double-digit growth in the QTD. Meanwhile, growth in the U.K. is up at barely a 2% pace on a QTD basis. German output shows some recent weakness in this report. German exports also have foundered, falling in January after being flat in December. Even so German exports log a 15% growth rate over three months and export growth is still accelerating. But real export orders actually are falling over three months. So there is a crucial mass of orders, output and exports data that read 'weak' for Germany, although there is no fundamental reason to expect German growth to back off. Globally, the ongoing sluggishness has been in Asia vs. the EMU where growth is on an upswing showing some degree of strength. It is reasonable that the European revival would not continue at this pace and would slow. One missing piece is still that the European consumer sector has not looked strong. But there are no grounds for any concern about growth. The ECB met this week and swept away its bias for stepping up securities purchases in the event of unexpected weakness. In Japan, the Bank of Japan announced that fiscal 2019 would probably be its end game for inflation stimulus. The U.S. continues to raise rates; today's employment data for February will keep the Fed rate hike cycle alive or even push it ahead a bit. Winter has been harsh and it's possible that the German data are reflecting this, but usually when weather is the culprit it's the construction sector that does not perform and so far it is doing well. 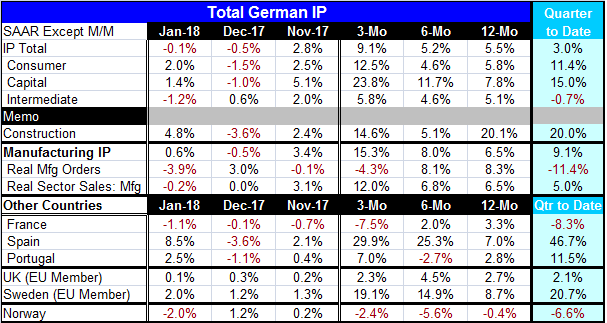 However, both French and German IP were hit in January and that could be a common weather impact. There were some severe snow storms in Europe in January; in fact, bad weather is continuing. It is harder to explain how weather might be to blame for weaker orders. It is more likely that this period of revival in output is a shifting of the gears to a pace that is more sustainable and that the process of slowing down is not entirely smooth. For now that is my working hypothesis of what the German data are telling us.